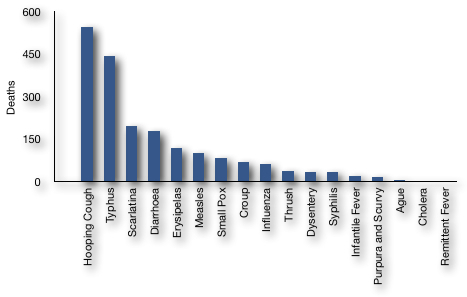 A while ago I made the point that many of the biggest killers of 19th-century London were almost unknown today, because of vaccination (“hooping cough”, measles, smallpox) and sanitation (typhus, cholera) (see “Life & Death, pre-vaccination“). I have a small confession to make: I kind of rigged that chart, because I wanted to avoid a complicated story that I didn’t know much about. I still don’t know much about it, but I’ll share my ignorance with you, dear readers, because it’s a fascinating story and because it hooks up with something else I want to talk about, maybe later this week. What’s missing? 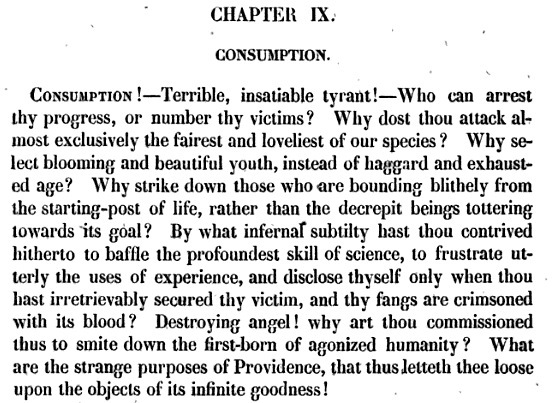 The biggest killer of them all;1 it’s not included in this section because before 1882,2 they didn’t know tuberculosis (“consumption”) is an infectious disease. 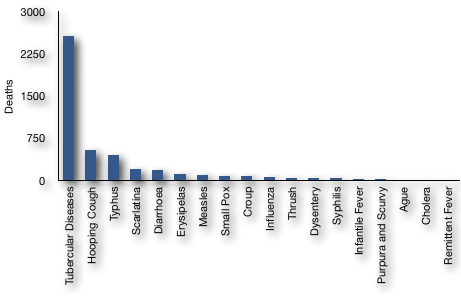 Here’s what happens when we include “tubercular diseases” in the same chart — watch the scale! 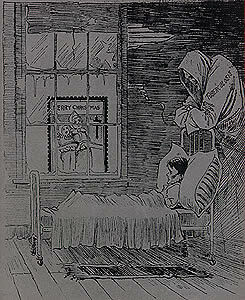 In developed countries most of us don’t think about tuberculosis much, but in the 19th century it was everywhere. The poor — crowded and malnourished — were at the most risk, but consumption spared no one. Rich and poor, merchant or noble or laborer, everyone had friends and family who died of consumption. 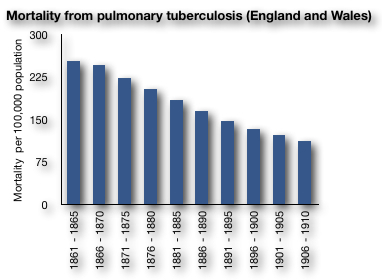 Why was Tb becoming less common? Well, this is the part I don’t actually understand very well, but according to Arthur Newsholme4 in 19085 this was indirectly because of the Poor Law of 1834 (Wikipedia on Poor Laws). The Poor Laws were very, very primitive versions of welfare; the 1834 Act brought about a system of workhouses, where the desperately poor — and they had to be utterly desperate — were fed (barely) and housed (kind of ) and generally abused. The point being, the poorest of the poor were kept in these workhouses; because the Tb sufferers, who couldn’t work normally, tended to be the poorest of the poor, they were housed in the workhouses and essentially quarantined. 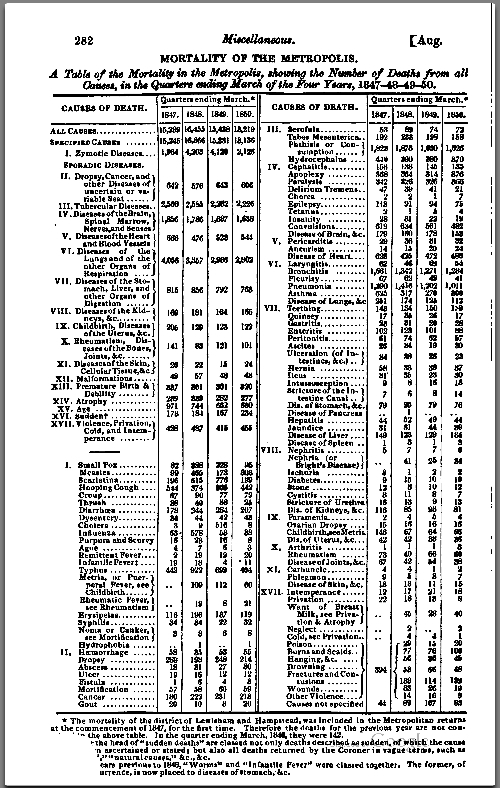 After Koch demonstrated that Tb is contagious, in 1882, quarantine became a deliberate policy6 and rates dropped still more; and when antibiotics were introduced in the 1940s, rates of Tb dropped still more. So although I said the biggest killers of the 19th century have been almost eliminated by sanitation and vaccination, that’s not really true of tuberculosis. Antibiotics broke the back of the disease, but it was already being controlled to a large extent by social factors and then by medical opinion — one of the few cases where formal medicine actually had an influence on these diseases. The Prevention of Tuberculosis, by Sir Arthur Newsholme.